The call for this weeks #SundaySupper Chili Cook-Off went out, and I immediately knew I had to participate. To enter this prestigious chili cook-off, I tied on my thinking cap and came up with a fun twist to my traditional homemade Kudos Kitchen chili. The result is a unique and flavorful recipe I like to call Olé Mole Turkey Chili. It may not be a traditional chili in terms of what you’re used to, with the addition of cocoa powder and cinnamon, but that’s what makes it original…and fun! I could have added this chili into the “mixed meat” category for #SundaySupper because it contains ground turkey and chorizo. But truth be told, I didn’t know what ingredients I’d be adding until it was time to stand at the stove and cook. But that’s pretty typical of how I work in the kitchen anyway. That said, you know that when you’re having fun in the kitchen, you’re on the right track! Olé!!! This chocolaty, cinnamony (is that a word? LOL), and meaty chili is warm, pungent and mildly spicy with just a slight hint of Mexican beer in the background for a little added depth of flavor. One spoonful of this chili and you’ll soon be singing its praises…Olé, Olé, Olé, Olé, Mole, Mole, Mole, Mole! Warning: Don’t let the somewhat long list of ingredients put you off from making this recipe! While the list might be long, the ingredients are mostly spices and seasonings that you probably already have on hand in your own pantry. You also don’t need to use Mexican beer. You can use whatever beer you happen to have on hand, or you can opt out of the beer altogether and substitute an equal amount of water with a splash of apple cider vinegar, or the juice of one lime, for a little hint of brightness that brings all the flavors together. -In a large Dutch oven over medium/high heat, brown the ground turkey and chorizo in the olive oil, stirring often. Season with 1/2 teaspoon salt and 1/4 teaspoon black pepper. -Add the bell peppers, onions and garlic and cook, stirring occasionally, for approximately 3-4 minutes. -Reduce the heat to medium/low and stir in the remaining ingredients, in the order given. -Cover and allow the chili to simmer for at least 30 minutes. -Ladle the chili into large bowls and garnish with a dollop of sour cream and a bit of shredded cheddar cheese if desired. This is the point for each #SundaySupper recipe I post, that I like to give a big shout out and thank you to our hardworking host for the week. This week it’s one of my favorite bloggers and someone I’ve never met in person, but feel like I know…Heather, of Girlichef! Thanks so much, Heather. The hard work, in all you do, does not go unnoticed! 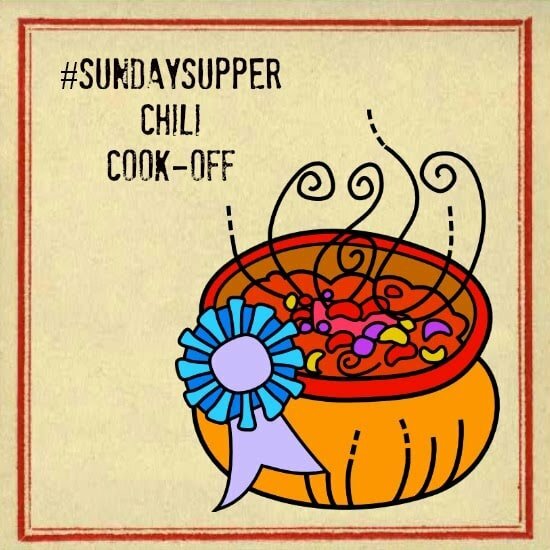 From bison to vegetarian (and all the chili’s in between), check out all the other wonderful and inventive chili cook-off recipes from the #SundaySupper team of cooks and once you’ve viewed all the recipes, you can cast your VOTE HERE up until 2/27/14! Good luck to all the contestants! LET’S EAT! What a fun recipe! I love love love the addition of Chorizo. I can just imagine the flavor. Such a cute name, Renee! But the flavor is far more than cute…it sounds amazing!!! Love the chorizo and the fire roasted chiles!!! When I experienced my first taste of Mole in Oaxaca, Mexico, I was smitten with my first bite of this wonderful flavor! Great chili recipe, Renee! I love that you added chorizo to the chili! I love everything about your dish!! This is so perfect and warming! 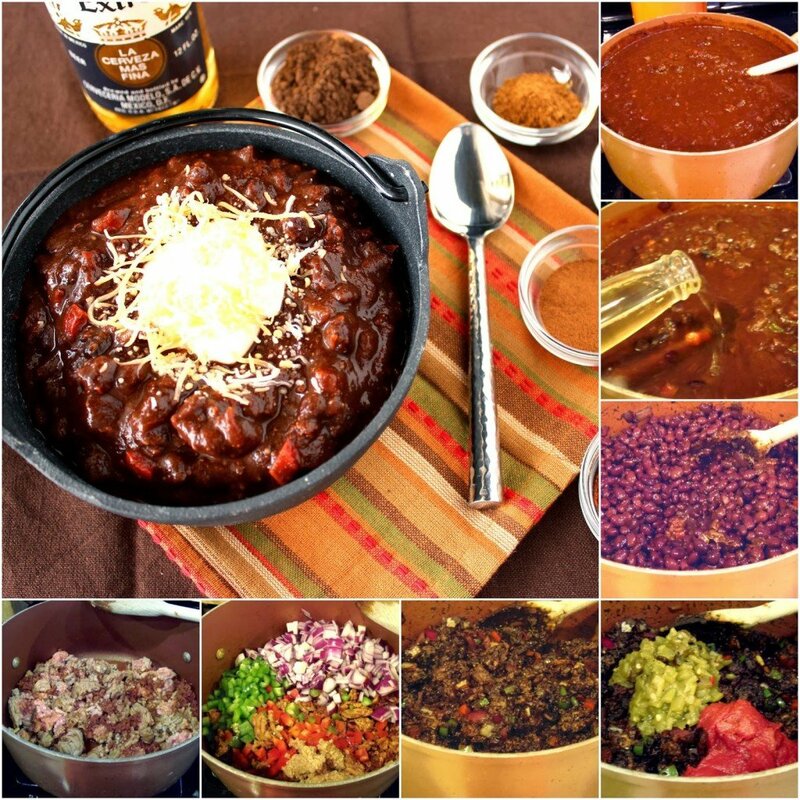 Wow at the flavors and spices going on in your chili. This is definitely one to make. Oh, and I'm so down with beer in chili too. You and I are mole queens today! Thick, rich and delicious looking chili!!! I love lots of ingredients in chili, it gives it so much depth!!! You win for the most creative title, haha I love it! Oh my, your turkey chili is a thing of beauty! And the title is seriously awesome! 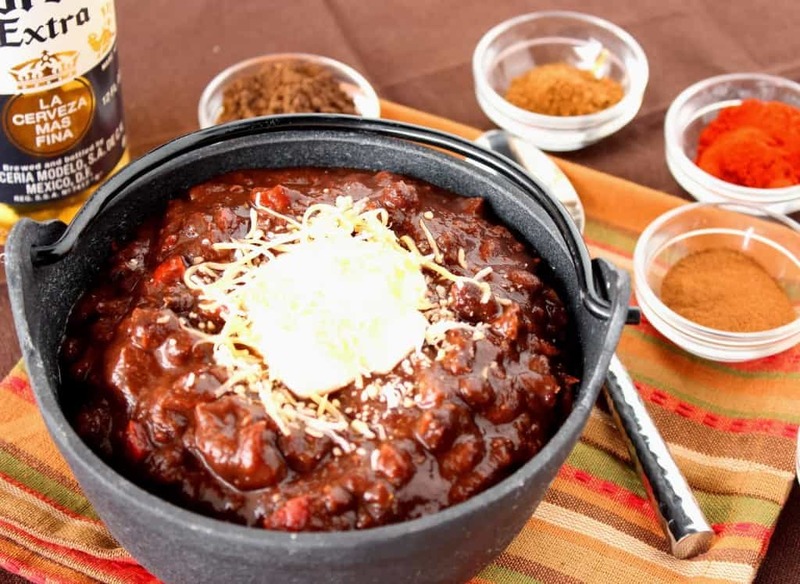 I need more chocolate in my life – in the chili? Why not! Love it! 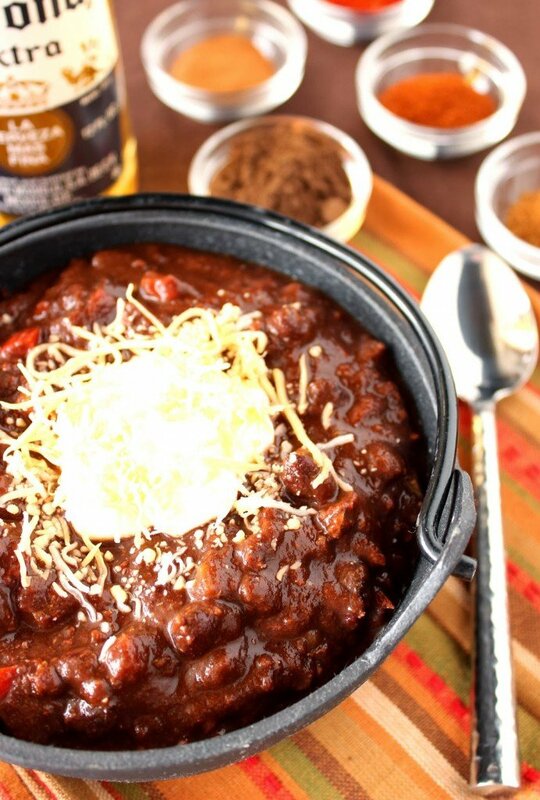 Ohhhh I am so intrigued by the mix of cocoa and cinnamon in this chili! It looks soooooo good! Chorizo in chili? Oh yes please and what a great selection of spices you have going on. When I saw you were going to post a Mole chili I was so excited but I am even more thrilled now that I see your recipe because it doesn't use a already prepared Mole sauce. We can't get that here and we miss enjoying the flavour of Mole sauce so now it makes me think I can make it on my own. I actually think I have all the ingredients for this one on hand right now so I am so excited to try it. I have been super excited for this recipe since I saw your title. Mole + chili? Yes please! This is simply amazing! From Delaware Girl Eats — I'm a sucker for mole! That chorizo and cocoa addition is just perfect. You had me at chorizo! I would absolutely adore this chili! Pinning!